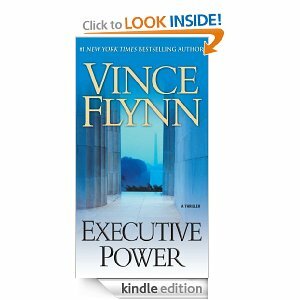 Continuing my way through the Mitch Rapp series, I re-read Executive Power again. This is a turning point for Mitch, where he is more mature, he's married to Anna at the White House and on his honeymoon. Unknown to him, however, there is a SEAL team in the Philippines that is set to rescue a family that was taken hostage. They're ambushed on the beach, and two men die. When Rapp returns, he's furious. He finds out two government people warned the Phillippine government that the rescue was coming and one of the generals is being bribed by the terrorists. As usual, Rapp has a plan and he uses it to get his way. He flies over, has the General killed, but stumbles on the American hostages. Using the SEAL team there with Coleman, he's in on the rescue, getting shot in the process. This is where we see Rapp becoming more of a maturing worker. He's older, and he promises Anna after a fight that he won't take part in any more operations. However he's not done. A Palestinian terrorist is no the loose, determined to bring about a Palestine state. He kills a few people in the Middle East and then assassinates a couple more on US soil. Fortunately with the help of his crack team, Rapp tracks him down, just in time to prevent the abandonment of Israel by the US. His hands get dirty one last time, taking down a Saudi prince that was funding the terrorism, since we can only expect so much change from him. A good read, not quite as exciting as a few of the others, but still a great way to enjoy a little downtime while traveling.